The Cormorant is one of the premier catamarans that sails the Galapagos Islands, allowing a maximum of 16 passengers for an intimate journey in the world’s most remote archipelago. The vessel’s structure offers a stable cruising experience, and aboard you will find a spacious Jacuzzi as well as well-appointed and spacious cabins fit for honeymooners, couples, and families alike. The Cormorant catamaran is a beauty to behold in the Pacific seas that link the magical Galapagos Islands. This is among the newest vessels to sail the archipelago and incorporates sleek, modern design with a simplicity that appeals to even the most well traveled vacationers. Like its cousin the Ocean Spray, the Cormorant has capacity for 16 passengers, with the defining factor being that it is also home to 2 sets of Staterooms that can be connected. 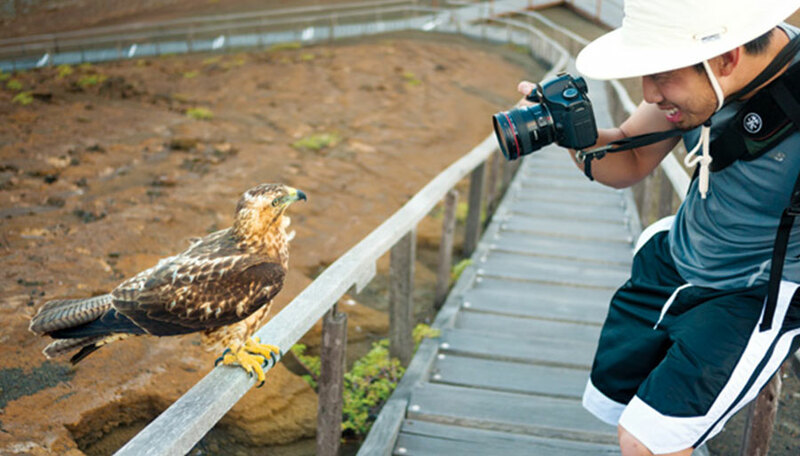 This is a great feature for groups and families that want unfettered access to each other during their Galapagos cruise. As well, there are 2 Suites for travelers looking for an upgraded experience and comes with one sofa bed each in case you want a triple room arrangement. All Staterooms and Suites come with en-suite plasma televisions, USB hard drive preloaded with about 250 movies, and DVD player which are not found on the Ocean Spray. We also want to mention that the facilities in each cabin are impressively resourced, with always fresh and clean towels replaced throughout the day, and fine wood finishing. On board, you will find a Jacuzzi fit for up to 4 people on the Sun Deck, a stocked library in the lounge, and 2 well-serviced bars for kicking back and relaxing. Wetsuits and snorkeling equipment are included, as are the use of the high quality kayaks and walking sticks for extra support during hikes. After exploring the Galapagos with the vessel’s extremely knowledgeable guides on 2 or more excursions daily, you can be sure to go to bed tired… yet ready for more!